So … let’s pretend that instead of being August 17th, it’s MARCH 17th. 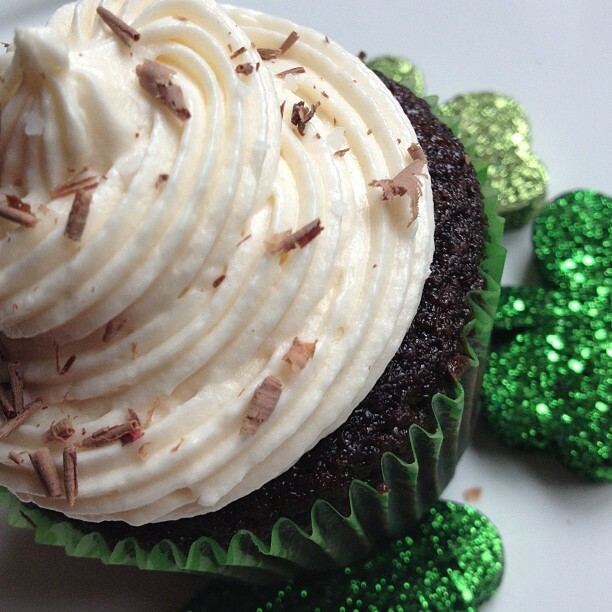 Because if we do that, then I won’t be five months late in posting this St. Patrick’s Day recipe. Which I am. I made these for the first time this year, and it made my family swoon. Really. My son asked for them again the following week. They came up in conversation later that month, and heads nodded at the memory. What more can you ask of a humble cupcake? I’ve been cooking with wine pretty much all my cooking life, and I’ve made other cakes with Guinness. I don’t have a problem with this, because I know that the alcohol cooks off in the process. But because the frosting in this recipe is not cooked, and because I know some people do not cook with alcohol, I’ve included suggestions for some non-alcoholic substitutes. Preheat oven to 350° F and line cupcake pans with paper liners. In medium pan, combine the stout, butter and cocoa powder. Stir and whisk until the butter has melted and the mixture is smooth. Remove from heat and let cool ten minutes. In mixer, beat eggs until fluffy, then add sour cream and vanilla and blend. Add the stout mixture (which has cooled for ten minutes) and blend. In a bowl, combine the flour, sugar, baking soda and 1 1/2 tsp kosher salt and mix well. Add these dry ingredients to the rest of the cupcake batter and mix just until combined. Be sure to scrape down the sides of the bowl so no dry ingredients are left behind. Pour batter into cupcake pan, filling the cups about 2/3 full. Bake 16-18 minutes, or until a toothpick inserted in the center comes out clean. Shave bittersweet chocolate into a heatproof bowl. I use my potato peeler for this. In a pan, heat the 2/3 cup of heavy cream just until it comes to a simmer. Add the butter (cut into slices for easier melting) and stir for one minute, then turn off heat and keep stirring until butter is melted. Pour mixture over the shaved chocolate and stir until melted. Add the 2 tsp of Bailey’s OR 2 more tsp of heavy cream. Stir well. 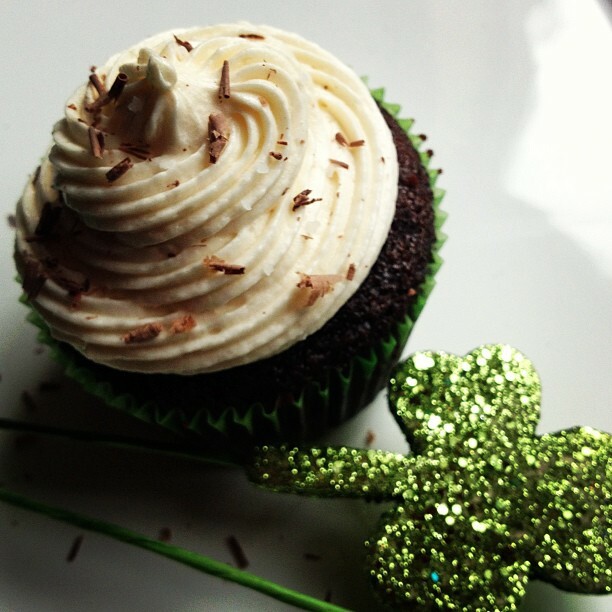 Let ganache cool slightly while you prepare the cupcakes but cutting a small cone-shaped hole in the center of each. You just want to make enough room for a marble-sized amount of ganache. If you really want to make a mess, you can spoon all the ganache into a piping bag and use that to fill the cupcake holes. But I didn’t feel like using and then cleaning my piping bag twice, so I just used a small spoon to scoop the slightly-firm-but-still-soft ganache into the cupcake holes. Worked great for me. In mixer, beat butter until fluffy. Slowly add 6 cups of the sifted powdered sugar and mix well. Add the Bailey’s and heavy cream (or all cream) and mix until smooth. Check the consistency of the frosting. If too thin, add more powdered sugar to thicken. I used as little sugar as I could get away with so it wasn’t overpoweringly sweet. Frost cupcakes. 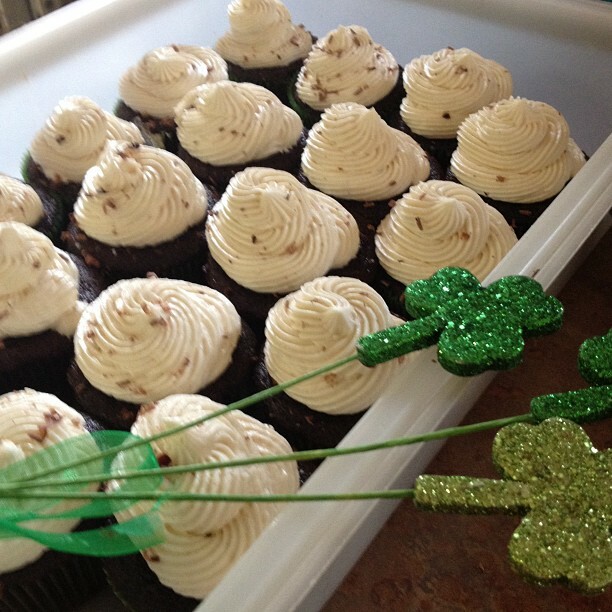 You can pipe the frosting into a piping bag or just spread with a spoon. But I think the piping looks nice. Sprinkle with more shaved chocolate and a light sprinkling of kosher salt. That’s not in any of the recipes I looked at, but I thought these cried out for a little salt.